So what is biomechanical podiatry? Podiatrists are people who treat conditions that affect your feet and lower limbs. And the term ‘biomechanics’ refers to the mechanical way in which your body moves. Many people suffer from pain or injury in their lower limbs or back due to the posture of their feet and how they use them. 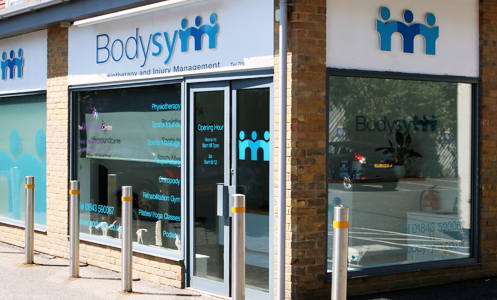 At Bodysym, our experienced podiatrists can assess the structure, alignment and function of your feet and lower limbs. Then they identify ways to improve how you move and walk in order to help reduce any pain. You may need special shoe inserts (known as orthotics) to change how your feet move and to support them correctly as you walk. We can also create a personalised stretching and exercise programme. An orthotic is an in-shoe device which alters the way your foot interacts with the ground. It can reduce the amount of rolling (in or out) as you step and reduce pressure on painful areas. Orthotics are generally factory-made (or made-to-measure for severe problems) and can usually be transferred between most of your shoes. Bodysym can source standard, sports, bespoke and children’s orthotics in a wide range of fits, materials and colours. Please note orthotics won’t necessarily cure a condition. They’re there to improve the position of your feet and lower limbs. During our 1-hour assessment, we examine your feet and lower limbs then analyse your gait (way of walking) on a treadmill using state-of-the-art video software. Afterwards we discuss our findings with you and advise which orthotic device will suit you best, if you need one. Then we develop a programme of exercises to help you regain full, comfortable movement.